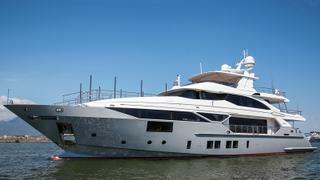 Italian yard Benetti has delivered the fourth hull in its Fast 125 series, which has been named Lejos 3. She will now head off on her maiden season cruising around the Mediterranean, the yard added. Formerly known as Hull BF104, this 38.1 metre displacement yacht was built to RINA classification from a GRP hull and superstructure. She follows on from sister ships Iron Man, Constance Joy and Skyler. Lejos 3 features sleek and sporty exterior styling by Stefano Righini, while British studio RWD designed all of the 320GT interior, using a contemporary colour scheme called Air. Accommodation is four ten guests split between five staterooms, including a main-deck owner’s cabin and four VIP cabins below decks. Communal spaces on board Lejos 3 range from the main-deck saloon/dining area to the smaller upper deck saloon and the all-important superyacht sundeck, which has been fitted with a swimming pool. A second pool has been fitted in the foredeck seating area. Power comes from a Rolls-Royce Azipull system and a pair of 2,600hp MTU 12V2000 M94 engines, which combine with the D2P hull form by naval architect Pierluigi Ausonio to ensure a comfortable cruising experience across a wide range of speeds. Lejos 3 tops out at 24 knots, but when trimmed back to her cruising speed of 12 knots, she will boast a maximum cruising range of 1,750 nautical miles, drawing on a total fuel capacity of 25,000 litres. Other superyacht projects currently under development at the Italian yard include the 28.96 metre Benetti Delfino 95, which is due to hit the water before the end of the year.